I read this book last summer and it really stuck with me. A bunch of my more mature 7th graders read it over the school year and voted it as their favorite book of the year. This book was nominated for the 2009-10 Maryland Black Eyed Susan award. I wouldn’t call it a light read. Very serious subject matter and there is one very disturbing chapter. The book’s premise is that instead of abortion, children can be “unwound” between the ages of 13-18 if they have not proved themselves useful to society. Unwinding means surgically cutting the teens up into “parts” which are then used like organ donations–every part of each teen is used. This was the kind of book that makes you think. 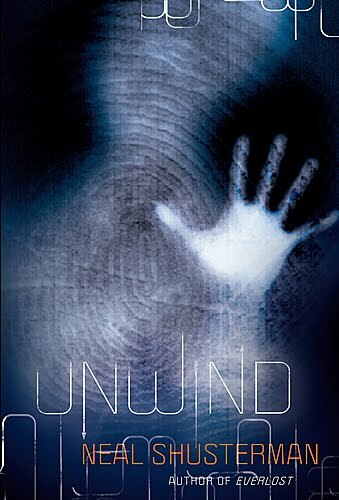 You rooted for the characters and kept turning pages to find out if they’d make it to the end without getting “unwound.” I think it’s pretty mature subject matter for middle schoolers, but would be more appropriate for high school aged kids. However it was definitely an original sci-fi concept and I haven’t read anything like it.